» Treaty is a a formally concluded and ratified agreement between states. » Various treaties were signed in Indian History between kings. » Some famous/important treaties in Indian history are Treaty of Asurar Ali, Treaty of Alinagar, Treaty of Madras, Treaty of Mangalore, Treaty of Lahore and Treaty Amritsar. 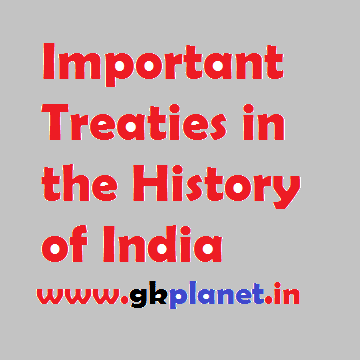 » Important treaties in Indian history are listed below. The treaty established the boundary between the Mughal empire and the Ahom kingdom ending the Mughal's efforts to conquer Ahom. The Treaty of Purandar was signed in 1665 between the Rajput ruler Jai Singh I, who was commander of the Mughal Empire, and Maratha Chhatrapati Shivaji Maharaj. Shivaji was forced to sign the agreement after Jai Singh besieged Purandar fort. When Shivaji realised that war with the Mughal Empire would only cause damage to the empire and that his men would suffer heavy losses, he choose to make a treaty. Henceforth the maratha king became the mayor of the place and the peshwa emerged as the real head of maratha federacy. Signed between Siraj-ud-dwala and Robert Clive allowing the British to fortify Calcutta and also allow British goods to pass through Bengal without duties. The french were defeated by the british company and its settlements were captured. The french possessions in india were ,however restored by this treaty. The Treaty of Allahabad was signed in 1765, between the Mughal Emperor Shah Alam II, son of the late Emperor Alamgir II, and Lord Robert Clive, of the East India Company, as a outcome of the Battle of Buxar of 1764. As per the terms of the agreement, Alam granted the East India Company Diwani rights, or the right to collect taxes on behalf of the Emperor from the eastern province of Bengal-Bihar-Orissa. This Treaty marks the political and constitutional involvement and the beginning of British rule in India. The Treaty of Madras was signed between the British and Hyder Ali of Mysore to bring to and end the first Mysore War. Under the treaty, both the parties agreed to return the areas won the each and to support each other in case of a thrid party invasion. Between hastings and nawab of oudh. Allahabad was handed over to nawab. On the death of shuja ud daula in 1775 , a new treaty was concluded with his successor , according to which a regular brigade of the company's troops was stationed in oudh.. Signed between the British and the Marathas bringing the first phase of the First Anglo-Maratha War to an end. Signed between the British and the Marathas bringing the second phase of the First Anglo-Maratha War to an end. Signed between the British and the Marathas bringing the First Anglo-Maratha War to an end. Signed between the British (Lord Cornwallis), the Marathas, Hyderabad and Tipu Sultan. This ended the Third Anglo-Mysore War allowing the Marathas, the Nizam of Hyderabad and the British to annex almost half of Tipu Sultan's territories. Signed by baji rao II with the english after his defeat at the hands of holkar. Holkar gave up claims on the areas of company's allies. Between ranjith singh and the english company , which fixed the river sutlej as the boundary of ranjith singh's authority. After the english victory over nepal , the treaty was signed . The nepal ruler gave up his claims to sikkim , ceded the disputed tarai tracts , and received a resident at khatmandu . Great britain agreed to help iran with men and money against any european invader . Signed between Governor General Air Henry Hardinge for the British and members of Lahore darbar representing the young Maharaja Duleep Singh Bahadur. The treaty marked the end of the First Anglo-Sikh War. The Treaty of Amritsar followed the Treaty of Lahore. By this treaty the British East India Company sold Kashmir to Maharaja Gulab Singh, whose dynasty ruled till 1947, when Maharaja Hari Singh acceded Kashmir to India. By this treaty , rani jindan was deprived of all powers and the administration was to be carried on by a ' council of regency ' composed of eight leading chiefs under the virtual dictatorship of the british resident .